Maybe my favorite part of this project is the opportunity to encounter old horror movies and feel connected to the generations of chroniclers of cinematic scares that came before me. 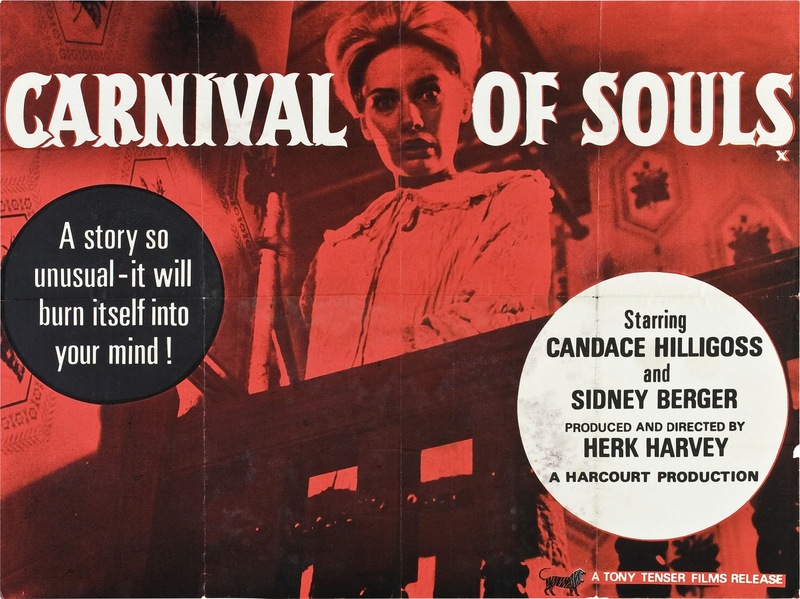 This sense of film history drew me to today's entry, 1962's Carnival of Souls. Long considered a cult classic, Carnival of Souls is the atmospheric horror movie to end all atmospheric horror movies. Mary Henry (Candace Hilligoss) suffers a traumatic even when she and her friends careen off of a bridge in an ill-fated drag race (remember those?). Shortly after walking away as the lone survivor, she takes a job as a church organist in Salt Lake City and upon her arrival there finds herself haunted by a number of ghostly figures. She soon figures the source of the specters to be a nearby abandoned carnival pavillion, though when she goes to investigate, the otherworldly apparitions only get worse. I got to see this movie at the Brooklyn Academy of Music to a fairly full theater on a Monday night, which speaks volumes about the supposed B-movie's appeal and notoriety. Carnival forgoes the traditional domain of horror movies of the time and instead of easy scares meant for kids, spends its time creating a spooky atmosphere that proves that Utah really is the most wicked and terrifying state in the Union. The specters in particular were really scary. Decked out in old formal wear and Taylor Momsen makeup, one can see the direct line between this film and George A. Romero's Night of the Living Dead which would premiere six years later. The movie also uses techniques and stylistic choices more reminiscent of German expressionism that set it apart from typical matinee fare. But was it scary? I never found myself looking through my fingers in fright, but I don't think I can look out my window without fearing a phantom visitor peering in on me. Hey! This movie's in the public domain! Which means you can save yourself twelve bucks and watch it for free!